The Nim team is happy to announce that the latest release of Nim, version 0.19.4, is now available. Nim is a systems programming language that focuses on performance, portability and expressiveness. The mark&sweep GC had a serious performance regression that has been fixed. The produced tarballs now support koch tests. Json escaping has been fixed. The documentation for async procs was missing, fixed. If you don’t have it already, you can get choosenim by following these instructions or you can install Nim by following the instructions on our install page. Programs should run on my local system so that I’m in control of them, this excludes cloud solutions. Programs should run in the terminal, so that they can be used consistently from anywhere, including weak computers or a phone. Keyboard focused is nearly automatic by using terminal software. I prefer to use the mouse where it makes sense only, reaching for the mouse all the time during typing feels like a waste of time. Occasionally it took me an hour to notice that the mouse wasn’t even plugged in. Ideally use fast and efficient software, I don’t like hearing the fan and feeling the room heat up. I can also keep running older hardware for much longer, my 10 year old Thinkpad x200s is still fine for all the software I use. Be composable. I don’t want to do every step manually, instead automate more when it makes sense. This naturally favors the shell. I had a hard start with Linux 12 years ago by removing Windows, armed with just the Gentoo Linux installation CD and a printed manual to get a functioning Linux system. It took me a few days of compiling and tinkering, but in the end I felt like I had learnt a lot. I haven’t looked back to Windows since then, but I switched to Arch Linux on my laptop after having the fan fail from the constant compilation stress. Later I also switched all my other computers and private servers to Arch Linux. As a rolling release distribution you get package upgrades all the time, but the most important breakages are nicely reported in the Arch Linux News. One annoyance though is that Arch Linux removes the old kernel modules once you upgrade it. I usually notice that once I try plugging in a USB flash drive and the kernel fails to load the relevant module. Instead you’re supposed to reboot after each kernel upgrade. There are a few hacks around to get around the problem, but I haven’t been bothered enough to actually use them. Similar problems happen with other programs, commonly Firefox, cron or Samba requiring a restart after an upgrade, but annoyingly not warning you that that’s the case. SUSE, which I use at work, nicely warns about such cases. For the DDNet production servers I prefer Debian over Arch Linux, so that I have a lower chance of breakage on each upgrade. For my firewall and router I used OpenBSD for its clean system, documentation and great pf firewall, but right now I don’t have a need for a separate router anymore. 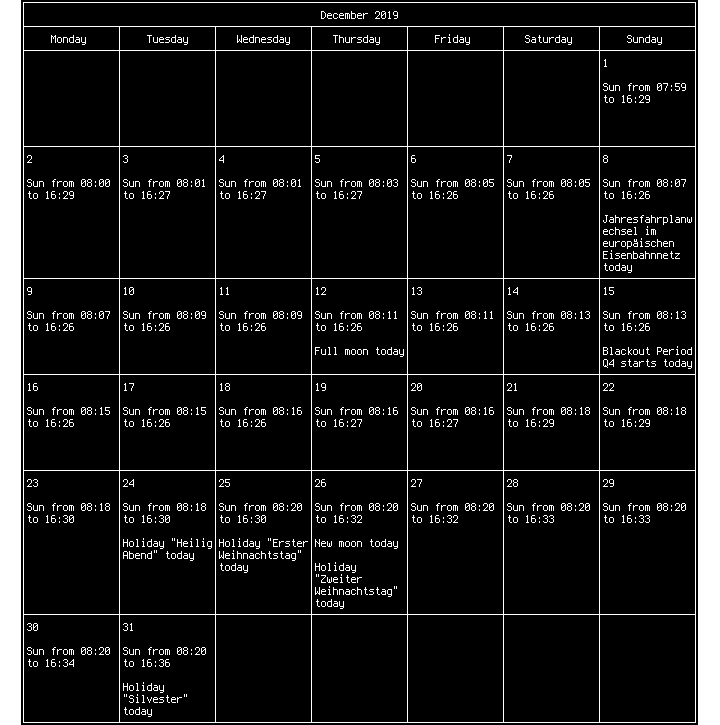 Since I started out with Gentoo I quickly noticed the huge compile time of KDE, which made it a no-go for me. I looked around for more minimal solutions, and used Openbox and Fluxbox initially. At some point I jumped on the tiling window manager train in order to be more keyboard-focused and picked up dwm and awesome close to their initial releases. In the end I settled on xmonad thanks to its flexibility, extendability and being written and configured in pure Haskell, a great functional programming language. One example of this is that at home I run a single 40” 4K screen, but often split it up into four virtual screens, each displaying a workspace on which my windows are automatically arranged. Of course xmonad has a module for that. And gets piped straight into dzen2 with conky | dzen2 -fn '-xos4-terminus-medium-r-normal-*-12-*-*-*-*-*-*-*' -bg '#000000' -fg '#ffffff' -p -e '' -x 1000 -w 920 -xs 1 -ta r.
One important feature for me is to make the terminal emit a beep sound once a job is done. This is done simply by adding a \a character to the PR_TITLEBAR variable in zsh, which is shown whenever a job is done. Of course I disable the actual beep sound by blacklisting the pcspkr kernel module with echo "blacklist pcspkr" > /etc/modprobe.d/nobeep.conf. Instead the sound gets turned into an urgency by urxvt’s URxvt.urgentOnBell: true setting. Then xmonad has an urgency hook to capture this and I can automatically focus the currently urgent window with a key combination. In dzen I get the urgent windowspaces displayed with a nice and bright #ff0000. I hear that i3 has become quite popular in the last years, but it requires more manual window alignment instead of specifying automated methods to do it. I realize that there are also terminal multiplexers like tmux, but I still require a few graphical applications, so in the end I never used them productively. In order to keep terminals alive I use dtach, which is just the detach feature of screen. In order to make every terminal on my computer detachable I wrote a small wrapper script. This means that even if I had to restart my X server I could keep all my terminals running just fine, both local and remote. 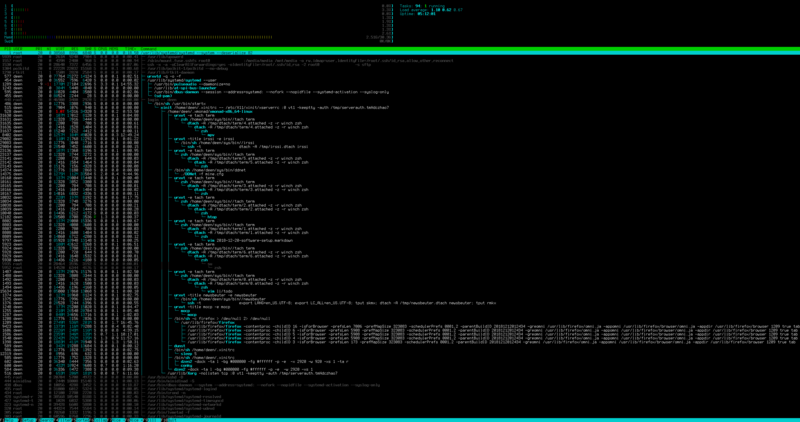 Instead of bash I use zsh as my shell for its huge number of features. As a terminal emulator I found urxvt to be simple enough, support Unicode and 256 colors and has great performance. Another great feature is being able to run the urxvt client and daemon separately, so that even a large number of terminals barely takes up any memory (except for the scrollback buffer). For programming and writing I use Vim with syntax highlighting and ctags for indexing, as well as a few terminal windows with grep, sed and the other usual suspects for search and manipulation. This is probably not at the same level of comfort as an IDE, but allows me more automation. 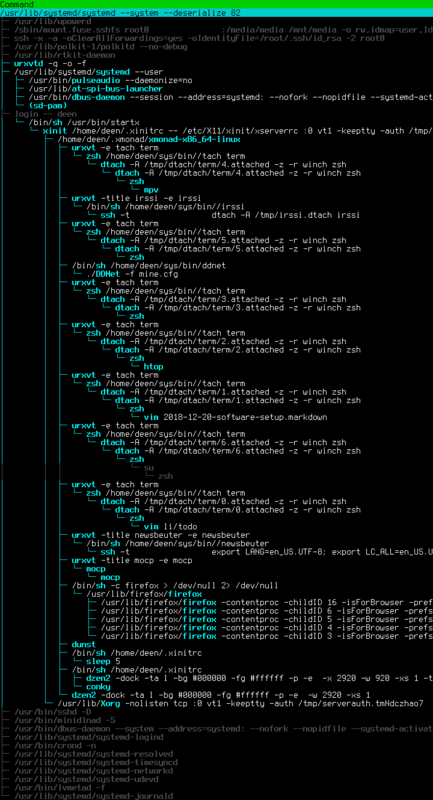 One problem with Vim is that you get so used to its key mappings that you’ll want to use them everywhere. Python and Nim do well as scripting languages where the shell is not powerful enough. 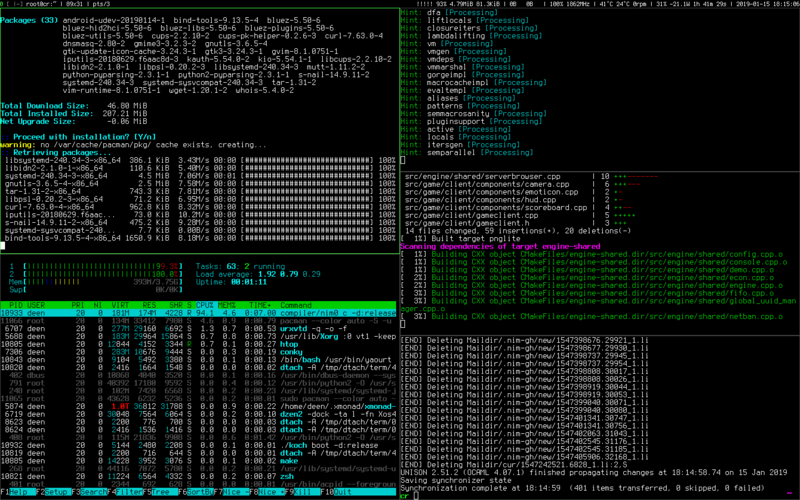 htop works great for getting a quick overview of what the software is currently doing. lm_sensors allows monitoring the hardware temperatures, fans and voltages. powertop is a great little tool by Intel to find power savings. ncdu lets you analyze disk usage interactively. nmap, iptraf-ng, tcpdump and Wireshark are essential tools for analyzing network problems. There are of course many more great tools. But so far the emails are still on the server. My documents are all stored in a directory that I synchronize between all computers using Unison. Think of Unison as a bidirectional interactive rsync. My emails are part of this documents directory and thus they end up on my desktop computers. This also means that while the emails reach my server immediately, I only fetch them on deman instead of getting instant notifications when an email comes in. ignore-article "https://forum.ddnet.tw/feed.php" "title =~ \"Map Testing •\" or title =~ \"Old maps •\" or title =~ \"Map Bugs •\" or title =~ \"Archive •\" or title =~ \"Waiting for mapper •\" or title =~ \"Other mods •\" or title =~ \"Fixes •\""
I use Irssi the same way for communication via IRC. FSET birthday(x) "'s " + ord(year(trigdate())-x) + " birthday is %b"
Unfortunately there is no Chinese Lunar calendar function in remind yet, so Chinese holidays can’t be calculated easily. I have a simple todo file containing my tasks, that is basically always sitting open in a Vim session. For work I also use the todo file as a “done” file so that I can later check what tasks I finished on each day. Sie haben bei mir seit dem Bla Bla Bla. Ich fordere Sie hiermit zu Bla Bla Bla auf. Further example documents and presentations can be found over at my private site. To read PDFs Zathura is fast, has Vim-like controls and even supports two different PDF backends: Poppler and MuPDF. Evince on the other hand is more full-featured for the cases where I encounter documents that Zathura doesn’t like. GIMP and Inkscape are easy choices for photo editing and interactive vector graphics respectively. In some cases Imagemagick is good enough though and can be used straight from the command line and thus automated to edit images. Similarly Graphviz and TikZ can be used to draw graphs and other diagrams. As a web browser I’ve always used Firefox for its extensibility and low resource usage compared to Chrome. Unfortunately the Pentadactyl extension development stopped after Firefox switched to Chrome-style extensions entirely, so I don’t have satisfying Vim-like controls in my browser anymore. MOUSE_BTN5 run "mixer" "pcm" "-2"
MOUSE_BTN6 run "mixer" "pcm" "+2"
youtube-dl works great for watching videos hosted online, best quality can be achieved with -f bestvideo+bestaudio/best --all-subs --embed-subs. As a music player MOC hasn’t been actively developed for a while, but it’s still a simple player that plays every format conceivable, including the strangest Chiptune formats. In the AUR there is a patch adding PulseAudio support as well. Even with the CPU clocked down to 800 MHz MOC barely uses 1-2% of a single CPU core. Linux is great to build packages for any major operating system except Linux itself! In the beginning I used QEMU to with an old Debian, Windows and Mac OS X VM to build for these platforms. Nowadays I switched to using chroot for the old Debian distribution (for maximum Linux compatibility), MinGW to cross-compile for Windows and OSXCross to cross-compile for Mac OS X. The script used to build DDNet as well as the instructions for updating library builds are based on this. As usual, we nearly forgot about backups. Even if this is the last chapter, it should not be an afterthought. I wrote rrb (reverse rsync backup) 10 years ago to wrap rsync so that I only need to give the backup server root SSH rights to the computers that it is backing up. Surprisingly rrb needed 0 changes in the last 10 years, even though I kept using it the entire time. Thanks for reading my random collection of tools. I probably forgot many programs that I use so naturally every day that I don’t even think about them anymore. Let’s see how stable my software setup stays in the next years. If you have any questions, feel free to get in touch with me at dennis@felsin9.de. Two years ago I talked about my hardware setup in two posts. 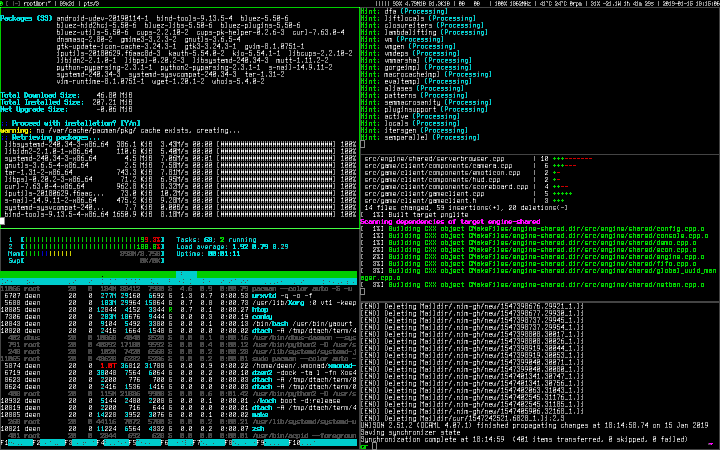 htop (look at the background of that site, it’s a live view of the server that’s hosting it) works great for getting a quick overview of what the software is currently doing. lm_sensors allows monitoring the hardware temperatures, fans and voltages. powertop is a great little tool by Intel to find power savings. ncdu lets you analyze disk usage interactively.